The 11 March disaster induced two kinds of displacement: first, the residents of coastal areas in Tohoku had to evacuate as the M9 earthquake struck and a gigantic tsunami engulfed their towns. Then, because of the damage to the Fukushima-Daiichi nuclear power plant, residents living in a radius of 20 km of the plant, and later expanded to the area detected with high radiation level, were evacuated by the Japanese authorities. In September 2012, 18 months after the disaster, 330,000 persons were still displaced in temporary shelters, nearly half of which are the evacuees from the Fukushima prefecture (i.e. displaced by the nuclear accident). This paper seeks to analyse and compare the different patterns of displacement that followed the disasters, and the perspectives of return and reconstruction. It seeks to understand how the evacuation was processed, which information the displacees were provided with, what caused their decisions to accept the evacuation, and assess the likelihood of a return of the population. The paper is particularly interested in the extent to which social and cultural context affected to the process. In addition, it also seeks to model the medium to long term impact of such a massive population displacement, both with regard to the region of origin and to the host communities. Given its geological conditions, Japan has developed an advanced system of disaster prevention and coping mechanisms against earthquakes and tsunamis over the years. The disaster drills conducted prior to the disaster and countermeasures such as tsunami barriers constructed along the coast indeed saved many lives. The tsunami warning was issued as early as three minutes after the earthquake, instructing residents to evacuate to higher grounds. Yet, in some instances, these preparations in fact created an excessive degree of reassurance among the local population, which as a consequence led them to underestimate the threat during the actual disaster. Some residents did not evacuate because they thought that the breakwater was high enough to stop the tsunami. Others misjudged both the need and timing to flee because their previous tsunami experiences had instilled a fixed idea in them that the tsunami would arrive 10-15 minutes after the earthquake: in reality, the tsunami came 30-40 minutes later. It is commonly assumed that local knowledge and experience are a key factor in reducing the population’s vulnerability in the face of disasters. Yet in the case of the Japanese disaster, previous experience proved to be one of the key factors in creating their vulnerability. Those who managed to evacuate are housed either in private and public apartments or pre-fabricated houses of about 30 square metres, depending on the size of the household. Since most of them wish to resettle on new lands located on higher grounds, instead of returning to the place where their houses once stood, the local authorities have begun intensive consultations with the displaced population in order to come up with a resettlement plan that meets the expectations of evacuees and ensures their safety from another disaster. Although this process takes time, the evacuees are well informed on the government plan and they are included in the decision making process. Overall, it appears that the evacuation related to the tsunami was relatively well-planned and the disaster preparation helped save many lives despite some unexpected counter-effects. Those evacuated because of the tsunami can now envision a resettlement to their new homes in order to rebuild their lives. The story of the populations evacuated because of the nuclear accident, however, is a completely different one. By contrast with the evacuation triggered by the tsunami, the evacuation from the nuclear accident was largely unprepared. Prior to the disaster, the possibility of a severe nuclear accident had always been downplayed by the Japanese ‘myth of absolute safety’ and thus an evacuation on this scale had never been envisioned, let alone exercised before. As a result, the evacuation orders issued by the government were poorly communicated to the municipalities, leaving them in the dark as to whether they should evacuate their residents or not and obliging them to improvise an evacuation on their own without any instructions. The recent Fukushima Accident Investigation Report compiled by the Investigation Committee commissioned by the Japanese Diet, reported that only 10% of the local population was informed on the first Evacuation Order issued by the government on the day of the accident. Furthermore, the residents were forced to evacuate with no information as to the gravity of the situation or the risk of radiation exposure. Thus, they fled without any idea of how long their displacement would last or how far they should go. Nor were evacuees instructed on how to protect themselves against irradiation during their flight. Second, the evacuation occurred in many stages, as the nuclear accident unfolded. On the day of the accident, the 11th of March, the zones within a 3-km radius from the plant were evacuated. The day after, the 12th of March, the evacuation perimeter was extended to the zones within a 10-km, than 20-km radius from the plant. On March 15th, the population living within a 20-30-km radius from the plant were ordered to take shelter indoors. More than one month later, on April 22nd, the same populations were advised to evacuate by their own means, while the areas with radiation levels of more than 20 millisievert[i] per year (20 mSv/year) would be evacuated within one month. Finally, on June 16th, spots with radiation levels of more than 20 mSv/year were recommended for evacuation. But not all contaminated areas were evacuated or recommended for evacuation. Thus the nuclear disaster itself induced two different kinds of displacement: those who were evacuated by the government, and those who decided to evacuate by themselves. 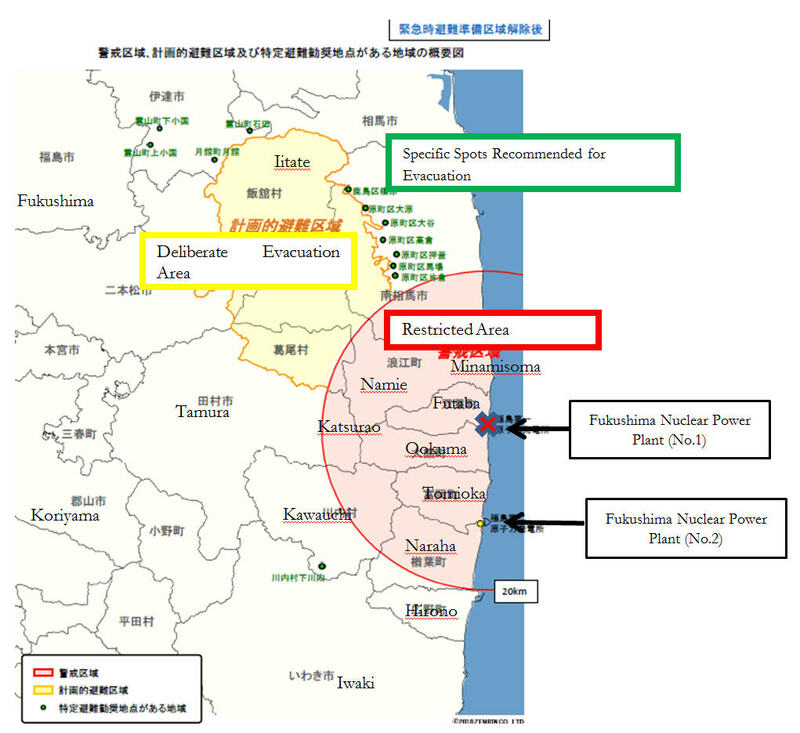 First, the residents living in a radius of 20 km of the plant (red zone in the map below) – and later expanded to the area detected with the radiation level of more than 20 mSv/year (green and yellow zones) – were evacuated by the Japanese authorities. These forced evacuees are officially recognized as nuclear evacuees by the authorities and receive financial compensation for their flight. As significant number of residents, however, were not evacuated by the authorities, despite their living in zones that were highly contaminated. Because of the fear of radiation effects, in particular on their children, many residents who were living outside of official evacuation zones began to evacuate on their own. These evacuees are called Jishuhinansha (‘self-evacuees’) or kuikigai hinansha (evacuees from outside of the zone) in Japanese. Considering as spontaneous and unofficial evacuees, the Japanese authorities do not grant them a full status of ‘nuclear evacuee’, and thus they receive very little assistance. The number of these self-evacuees is estimated around 50,000 and more[ii]. For these self-evacuees, the decision to stay, leave or return is highly dependent upon the measured level of radiations. Yet the acceptable level of radiation is subject to many controversies in public debates and in the scientific community. In the aftermath of the accident, the Japanese government raised the upper tolerable limit of radiation exposure levels from 1 to 20 mSv/year, in order to minimize the number of evacuations and encourage residents to return. In the absence of a social consensus on the acceptable level of risk, largely due to a widespread distrust in the official information, the affected population became lost and did not know what to believe or whom to trust. Many consulted the Internet in search of information apart from the one provided by the authorities, and the affected population started to take individual decisions to flee, stay or return according to his/her own perception of risk. It was up to each individual to make up his/her own decision to stay or leave. The acceptable level of radiations is thus a highly divisive issue in the affected communities. Both the departure of self-evacuees and the non-return of forced evacuees are considered as a threat for the social cohesion of these communities, and those who leave or do not return have to face discrimination and stigmatization within their communities. Japan is known for its high level of social cohesion: therefore, such tensions and divisions shake the foundation of the Japanese society and will have long-lasting effects in the future. The return or resettlement of the populations displaced by the tsunami has begun already, in which individual decisions as to where to resettle and whether or not to return to their hometowns, are well respected within the affected communities. The emphasis of the authorities is placed on the safety and well-being of the population in this process. In the zones contaminated by nuclear radiations, however, the situation is completely different. With the introduction of new radiation dose limit, policy priorities have thus been placed on decontamination operations to ‘cleanse’ the affected communities of radiation, thus reconquering the contaminated areas, and on the early return of evacuees. For the displaced municipalities, the question of return is a matter of their own survival: if the residents do not return, the town will disintegrate and ultimately disappear from the map, thus putting their existence and identity into jeopardy. Equally for other affected municipalities in Fukushima that are not under evacuation orders, voluntary evacuation of residents is viewed as a threat to the social cohesion and local economy. As a consequence, with slogans such as ‘Without the revitalization of Fukushima, there is no revitalization of Japan’ and ‘Don’t give up Fukushima!’, the authorities have set priority on the ‘normalization’ of the Fukushima disaster situation and urging the evacuees to return or the residents to stay to reconstruct their lives in Fukushima. Therefore, return has become a political project, where the evacuees themselves have little or no say. The coastal zone of the Fukushima prefecture, Hama-dori, located in the immediate vicinity of the nuclear disaster and with highest radiation levels, was forcibly evacuated. The houses were abandoned and the people scattered all across Japan, disrupting all community life. Those populations are today the victims of stigmatisation and often labelled as the ‘contaminated’ people. They receive – for now – a financial compensation from TEPCO, of around 1000 EUR/ person/month for their psychological distress and more for their lost employment and houses. But they also face many uncertainties as to whether they will eventually be able to return to their homes. The radiation levels in the region remain high, and the results of the decontamination efforts undertaken by some municipalities are still highly uncertain. This highlights a major difference with those evacuated by the tsunami: their perspectives of return are gloom. The intermediate zone, Naka-dori, is more urban than Hama-dori, which was predominantly rural. Despite the high levels of radiation, this zone was not evacuated by the authorities. Instead, the decision to evacuate or not was left up to the people themselves. Logically, while some chose to evacuate, others decided to stay. Those who evacuated were predominantly young and educated people, often with relatives living outside of Fukushima, or women and kids, while the husband stayed to work and make a living. Conversely, many of those who stayed were often economically deprived, old or sick, or no relatives to rely on outside of Fukushima. This means that the evacuation by some has significant consequences for those who stay, as the region will be impoverished by the departure of some of its young and qualified workforce. Those who decide to leave are pressured into staying, and there are significant tensions between those who stay and those who leave – the latter being considered as traitors by the former, who feel abandoned. Furthermore, those who decide to evacuate are not entitled to any compensation by TEPCO, except one-off payment of 800 euros, and are not assisted by the authorities. Finally, the zone that is the furthest away from the plant, Aizu, also suffers from stigmatisation. The region gets its key income from farming and touristic activities, and its economy has taken a huge blow because of the stereotype that the whole region was completely contaminated. Though no evacuation took place in the zone, it is likely that economic hardship will push some to seek employment elsewhere in the country. The contrasted patterns of evacuation led to significant tensions between forced evacuees and self-evacuees, between stayers and leavers, and tore apart communities and families. The population from the region of Fukushima continues to face stigmatization and discriminations across the country. The inequalities in the evacuation process have been instrumental in the transformation of the Fukushima into a social disaster. Some victims of the nuclear accident have been constantly neglected in both scholarly works and government’s actions: the ‘self-evacuees’ and ‘stayers’ living in the radioactively contaminated area located outside of the official evacuation zone. This population is often disregarded from official statistics and scientific articles alike, thus revealing the invisible victims of the Fukushima nuclear disaster. In the reconstruction process, the most significant challenges might therefore be those associated with social cohesion. [i] The sievert (Sv) is a unit to measure the radiation dose. 1 sievert (Sv) = 1,000 millisieverts (mSv). The International Commission on Radiological Protection (ICRP) recommends limiting artificial irradiation of the public to an average of 1 mSv per year, not including medical and occupational exposures. [i] This paper is based on the preliminary results of the DEVAST, a collaborative research project on the social and political impacts of the 11 March disaster. The project is jointly funded by the French National Research Agency (ANR) and the Japan Science and Technology Agency (JST). More information about the project can be found at www.devast-project.org . Nice, clear exposition of critical issues not raised by others: the role of official sanctioning of different classes of victims on the one hand, and the mechanism by which communities of origin can still exert pressure on those who have departed (this can be explicitly developed in the future, but it is inherent in the description of dividing families to protect women and children, while the husband remains in the risk zone for economic reasons). The authors note the failure/inability of the government to track voluntary evacuees; have there been informal and low-level (e.g., by administrators in districts receiving evacuees) efforts to track these people? Is there evidence to show how they have been received and how reception might differ by factors such as availability of locally-based relatives, discrimination based on stimulus to evacuate (Tsunami or nuclear), or timing of evacuation (more discrimination against early nuclear evacuees, perhaps less against those who evacuated when lower levels of radiation were set as the trigger for evacuation; still less for people who got out on their own even later)? Discussion of Aizu’s role is very abbreviated here. I hope you will elaborate the connection to the main theme of the paper in your presentation. I like how this paper incorporates voluntary relocation, as well as the problems facing the Aizu area, which received comparatively less radiation than prefectures south (echoing Phil’s comments — I would love to hear more about this). I’ve come across a few times discussions of fukushima divorces, often pitting a mistrustful wife against a husband who seems more willing to go with the government standards. I wonder if you could expand your discussion on voluntary relocation, or the decision to move back into towns that have been “cleaned up,” to incorporate whether there is a gender (or age) dynamic at work. Thanks for this quite interesting work–it connects well to Maki’s paper as we work to understand the dynamics of disaster recovery. To me this is a theme we should spend some time with–the cultural forces that work on survivors as they try to assess their health and safety. What a choice to have to make, one’s own health v. the commitment to the continued existence of one’s community. Exploring this further helps us understand why citizens and emergency planners view the same disaster in quite different ways.